Lift truck training is an OSHA requirement, but the importance of training pedestrians is too often overlooked. Have you considered offering basic awareness training to non-operators such as visitors, office staff or sales people who may venture into the warehouse or yard? 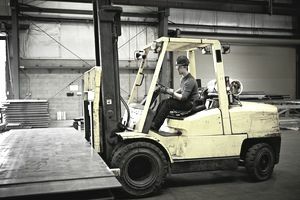 While OSHA does not address forklift-pedestrian training specifically, the OSHA General Duty Clause specifies that employers take measures to protect employees from recognized risks – including that of pedestrians exposed to lift trucks in action. Pedestrian safety is not an issue to be overlooked. According to the Bureau of Labor Statistics, close to 20 percent of all forklift accidents involve a pedestrian being struck by the forklift, translating to almost 19,000 people per year. Pedestrian did not see the lift truck. Many operations have varying degrees of intersections or blind corners of which the pedestrian should be aware. Pedestrian did not hear the truck. Be aware of different forklift power sources. For example, while internal combustion forklifts may be quite loud, electric trucks may be much quieter. An uninformed pedestrian may equate a lack of noise with the absence of moving lift trucks. Pedestrian came into too close proximity. Forklifts can pose a danger from all four sides. For a forklift that is running, a four-foot safety zone is recommended. This will address risks such as the machine driving over a pedestrian’s foot. The actual “kill zone” of the forklift may be much longer than four feet, however. Pedestrian wasn't aware of wide turning radius. With rear wheel steering, the back end of forklifts can swing surprisingly quickly to the side. Additionally, forklifts with elevated forks require proportionately greater safety clearance. Another consideration is the horizontal length of a load. Long loads on a forklift require a wider safety zone. And the outside of the long load turns a lot faster than the inside. Traffic Management – More effective traffic management can involve the demarcation of pedestrian-only routes to keep mobile equipment and pedestrians separate. This can involve signage and painted lines, but where possible, physical barriers to keep lift trucks from entering the pedestrian path provide a better solution. Establish and maintain safety rules around traffic right-of-way and pedestrian-only paths. Safety Equipment – On the part of the pedestrian, this starts with always wearing a high visibility vest and safety shoes. Additionally, forklifts are required to have horns and can be fitted with warning lights and forklift travel alarms such as a backup warning indicator – although there is some debate as to the actual effectiveness of too many warning devices on a truck. Curved mirrors can also be used to improve pedestrian safety at intersections. Another consideration is having the best forklift for the job at hand. Increasingly, onboard forklift cameras and sensors are helping provide operators with the tools needed to operate more safely. Training – When you think about training and pedestrian safety around forklift operators, there should be a three-tiered approach. One for managers who must ensure overall safety, one for forklift operators who may encounter pedestrians, and of course, training for pedestrians. Training for pedestrians. Pedestrian training need not be exhaustive, but it should cover the basic hazards related to forklifts and the rules that need to be followed. Knowing that trucks may appear suddenly around blind corners serves as a reminder to the pedestrian to stop, look and listen. Remember to make eye contact with the operator. The driver's vision may be impaired, depending upon the forklift. Another tip, if a forklift driver is facing away from you and your path seems to be adequately clear, you may want to verbally alert the operator and receive an acknowledgment back before crossing the path behind. Other pedestrian safety rules include never walking under a load, keeping clear of a forklift and load swing radius, and never riding on a lift truck unless specifically designed to accommodate a passenger. Communication and alertness are crucial. Forklift awareness training for pedestrians is an important step in making people aware of the hazards, and reinforcing those risks to veteran stakeholders who may grow complacent over time.